Tommy Leonetti (10 September 1929 –15 September 1979)  was an American pop singer-songwriter and actor of the 1950s, 1960s and 1970s. In Australia his most famous song was "My City of Sydney" (written by Leonetti & Bobby Troup)   and was used by the Australian TV channel ATN7 in Sydney for station identification into the 1980s. In America he achieved greater success as a songwriter for movies and Broadway plays. Tommy Leonetti was born Nicola Tomaso Lionetti in Bergen County, New Jersey in 1929. He married the American actress Cindy Robbins on November 27, 1965, in Beverly Hills, California,  and was stepfather to her daughter, Kimberly Beck. They lived in Sydney, Australia, in the 1960s and 1970s before returning to America. 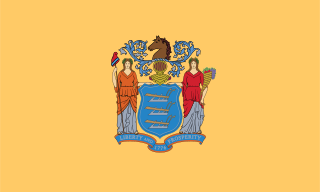 New Jersey is a state in the Mid-Atlantic region of the Northeastern United States. It is a peninsula, bordered on the north and east by the state of New York, particularly along the extent of the length of New York City on its western edge; on the east, southeast, and south by the Atlantic Ocean; on the west by the Delaware River and Pennsylvania; and on the southwest by the Delaware Bay and Delaware. New Jersey is the fourth-smallest state by area but the 11th-most populous, with 9 million residents as of 2017, and the most densely populated of the 50 U.S. states; its biggest city is Newark. New Jersey lies completely within the combined statistical areas of New York City and Philadelphia and was the second-wealthiest U.S. state by median household income as of 2017. Cynthia Chenault is an American television actress and producer/writer active from the mid-1950s to the present. She used the screen name Cindy Robbins in her acting credits. Married in 1958 to Patricia Quinn (later "Alice" in the 1968 film Alice's Restaurant ) and divorced in 1964 (no children). Leonetti acted in minor roles in American TV series: Gomer Pyle, U.S.M.C. (1964-1965 as 'Corporal Nick Cuccinelli'), I Spy (1966), Hawaii Five-O (1977), The Waltons (1978) and The Eddie Capra Mysteries (1978). He also had a film role in The Human Duplicators (1965) a science fiction alien invasion movie. Alice's Restaurant is a 1969 American comedy film directed by Arthur Penn. It is an adaptation of the 1967 folk song "Alice's Restaurant Massacree", originally written and sung by Arlo Guthrie. The film stars Guthrie as himself, with Pat Quinn as Alice Brock and James Broderick as Ray Brock. Penn, who resided in the story's setting of Stockbridge, Massachusetts, co-wrote the story with Venable Herndon in 1967 after hearing the song, shortly after directing Bonnie & Clyde. Gomer Pyle, U.S.M.C. is an American situation comedy that originally aired on CBS from September 25, 1964, to May 2, 1969. The series was a spin-off of The Andy Griffith Show, and the pilot episode was aired as the season finale of the fourth season of its parent series on May 18, 1964. The show ran for a total of 150 half-hour episodes spanning over five seasons, first in black-and-white for the first season, and then in color for the remaining four seasons. In 2006, CBS Home Entertainment began releasing the series on DVD. The final season was released in November 2008. 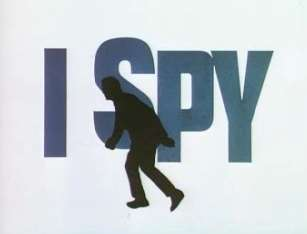 I Spy is an American secret-agent television adventure series. It ran for three seasons on NBC from 1965 to 1968 and teamed US intelligence agents Kelly Robinson and Alexander "Scotty" Scott, traveling undercover as international "tennis bums". Robinson poses as an amateur with Scott as his trainer, playing against wealthy opponents in return for food and lodging. Their work involved chasing villains, spies, and beautiful women. "Free", Leonetti's 1956 single, has been described as a US one-hit wonder peaking at number 23 on Billboard magazine's pop charts. He also had a minor hit with his version of "I Cried" which reached number 30 in 1954. Your Hit Parade (1957–1958), The Steve Allen Show (1958–1959) and The Tonight Show Starring Johnny Carson (1971–1973) featured performances by Leonetti. He also hit in the US with the only charted version of the spiritual "Kum Ba Yah" in early 1969 which hit No. 54 on the Billboard Hot 100 while topping at No. 4 on the Adult Contemporary chart (Billboard Hot 100 January 1, 1969 and the Adult Contemporary Chart on 12/18/68 (both from Joel Whitburn presents Across the Charts The 1960s). Tommy also hit the Adult Contemporary charts on 12/16/67 with his Columbia single You Knew About Her All the Time and again on 7/27/68 with All the Brave Young Faces of the Night. On 1/4/64 Tommy's recording of Soul Dance (RCA) hit the Bubbling Under the Hot 100 at No. 105 where it remained for 5 weeks (all info from Across the Charts 1960s Joel Whitburn, Record Research, Menomonee Falls, WI. While in Australia, Leonetti hosted his own talk-show from 1968 to 1970 for ATN-7, and provided the basis for the parody character Norman Gunston (according to creator Garry McDonald). "I Cried" is a popular song written by Michael Elias and Billy Duke. His final US chart record was "When I Needed You Most Of All", which, in 1974, reached Record World #120 in a 6-week chart run. He had a number 4 hit in Melbourne in 1968   with "Let’s Take a Walk" (In a recent interview his step daughter Kimberly Beck claimed she wrote "Let's Take a Walk" when she was 9 years old and recorded it with her stepfather Tommy at age 11 while residing in Sydney Australia. Kim is now known as actress Kimberly Beck. Leonetti's rendition of "My City of Sydney" (written by Leonetti and Bobby Troup, was used by ATN7 for nightly sign-off can be viewed on Video on YouTube. Sydney punk rockers XL Capris  (with lead vocalist Johanna Pigott) provided their version in 1979 (also on Video on YouTube), this promo includes blue-tinged portions from Leonetti's TV sign-off. Other versions were performed by yodeller Mary Schneider,  1990s punk rockers Frenzal Rhomb  and James Valentine on his radio show in February 2008. "My City of Sydney" was usually followed by a cartoon of a kangaroo putting its joey to sleep on a bed made from the words "ATN Channel 7," and was in use until the mid-1980s, when it was replaced by animator Debbie Glasser's cartoon about Sydney. Kimberly Beck is a former American actress and model. She is best known for her role as Trish Jarvis in Joseph Zito's Friday the 13th: The Final Chapter (1984). Her other film roles include Alfred Hitchcock's Marnie (1964), Luc Besson's The Big Blue (1988), George T. Miller's Frozen Assets (1992), and Roland Emmerich's Independence Day (1996). Robert Wesley Troup Jr. was an American actor, jazz pianist, singer and songwriter. He is best known for writing the popular standard "(Get Your Kicks On) Route 66", and for his role as Dr. Joe Early, opposite his real-life wife Julie London's character, in the 1970s US TV series, Emergency! According to Garry McDonald, the character of Norman Gunston and his television show were initially devised as a parody of Leonetti's late-night Sydney TV variety show, "The Tommy Leonetti Show", hosted by Leonetti from 1969 to 1970. Norman Gunston was a satirical TV character performed by Australian actor and comedian Garry McDonald. Norman Gunston was primarily well known in his native Australia, and to a lesser extent, the United States during the mid to late 1970s. He was the only Gold Logie winning fictional character on Australian television, with McDonald collecting the award in character. Edwin John "Eddie" Fisher was an American singer and actor. He was one of the most popular artists during the first half of the 1950s, selling millions of records and hosting his own TV show. Fisher divorced his first wife, actress Debbie Reynolds, to marry Reynolds' best friend, actress Elizabeth Taylor, after Taylor's husband, film producer Mike Todd, was killed in a plane crash. The scandalous affair was widely reported, bringing unfavorable publicity to Fisher. He later married Connie Stevens. Fisher fathered Carrie Fisher and Todd Fisher with Reynolds, and Joely Fisher and Tricia Leigh Fisher with Stevens. "A Big Hunk o' Love" is a song recorded by Elvis Presley and released as a single in 1958, reaching number one in the US. "Again" is a popular song with music by Lionel Newman and words by Dorcas Cochran. It first appeared in the movie Road House (1948), sung by Ida Lupino An instrumental rendition was used in the movie Pickup on South Street (1953). By 1949, versions by Vic Damone, Doris Day, Tommy Dorsey, Gordon Jenkins, Vera Lynn, Art Mooney, and Mel Tormé all made the Billboard charts. Gaetano "Tommy" DeVito is an American musician and singer, best known as a founding member, baritone vocalist, and lead guitarist of the rock band The Four Seasons. "Mule Train" is a popular song written by Johnny Lange, Hy Heath, Ramblin' Tommy Scott and Fred Glickman. It is a cowboy song, with the singer filling the role of an Old West wagon driver, spurring on his team of mules pulling a delivery wagon. As he goes about his work, the driver mentions the various mail-order goods he is delivering to far-flung customers. "Mule Train" was originally recorded by Ellis "Buz" Butler, Jr in 1947. Butler was the original writer of the song along with Fred Glickman. The original recording was released by Buz Butler on Decca Records. 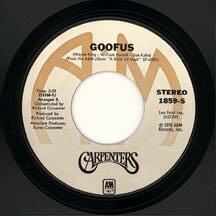 "Goofus" is a 1930 popular song with music written by Wayne King and William Harold and lyrics by Gus Kahn. "Crying in the Chapel" is a song written by Artie Glenn for his son Darrell to sing. Darrell recorded it while still in high school in 1953, along with Artie's band the Rhythm Riders. The song was rejected by Hill and Range Songs and Acuff-Rose Music. The song was eventually published by Valley Publishers which also released the single featuring Darrell Glenn. It became a local hit and then it went nationwide. The original version of the song was issued in May 1953. The song became one of the most covered of 1953. Darrell Glenn's original recording reached number one on the Cash Box charts and number six on Billboard. Darrell Glenn's original version also hit number six on the Billboard pop singles chart and number four on the Billboard country and western chart, Rex Allen's number eight, Ella Fitzgerald number 15, and Art Lund reached number 23. "I Think I Love You" is a song composed by songwriter Tony Romeo in 1970. It was released as the debut single by The Partridge Family pop group, featuring David Cassidy on lead vocals and Shirley Jones on background vocals. The Partridge Family version was a number-one hit on the Billboard Hot 100 in November 1970. The alternative rock band Voice of the Beehive scored a hit cover version of their own in 1991. There have also been many other cover versions of this song from artists such as Perry Como, Kaci and Katie Cassidy. "I Had the Craziest Dream" is a popular song which was published in 1942. "Ringo" is a popular song written by Don Robertson and Hal Blair. It was a hit single for Canadian-born actor Lorne Greene in 1964. "Moody Blue" is a song made famous by Elvis Presley. The song was written by Mark James who recorded the original version of the song, which reached #15 in South Africa during the summer of 1976. James also penned Elvis' "Suspicious Minds". "Hoop-Dee-Doo" is a popular song published in 1950 with music by Milton De Lugg and lyrics by Frank Loesser and released as a single by Australian children's band The Wiggles from their 2001 album Hoop-Dee-Doo! It's a Wiggly Party!. "Last Time I Saw Him" is the title of a 1973 single release by Diana Ross, being a composition by Michael Masser and lyricist Pam Sawyer: the track was produced by Masser and released in December 1973 at the same time as Ross' Last Time I Saw Him album. "Oh Lonesome Me" is a popular song written and recorded in December 1957 by Don Gibson with Chet Atkins producing it for RCA Victor in Nashville. Released in 1958, the song topped the country chart for eight non-consecutive weeks. On what became the Billboard Hot 100, it peaked at No. 7. It was Gibson's only Top 10 hit on the pop chart. Its B-side was "I Can't Stop Loving You", which peaked at No. 7 on the C&W Jockey charts and became a standard song about unrequited love. The vocal backings on both songs were provided by the Jordanaires. Lawrence Joseph Elgart was an American jazz bandleader. With his brother Les, he recorded "Bandstand Boogie", the theme to the long-running dance show American Bandstand. "Sweet Surrender" is the title of a popular song by the American singer-songwriter John Denver. It was originally recorded for his 1974 album Back Home Again, but was chosen as the lead single from the concert album An Evening with John Denver. "Sweet Surrender" reached #13 on the Billboard Hot 100 chart in February 1975, remaining in the Top 40 for eight weeks. It also rose to #1 on the adult contemporary chart, Denver's fourth song to reach the top on this survey. "Bouquet of Roses" is a 1948 song written by Steve Nelson (music) and Bob Hilliard (lyrics). It was originally recorded by Eddy Arnold and his Tennessee Plow Boys and his Guitar in Chicago on May 18, 1947. It was released by RCA Victor Records as catalogue number 20-2806 and by EMI on the His Master's Voice label as catalogue numbers BD 1234 and IM 1399. "Bouquet of Roses" was Eddy Arnold's third number one in a row on the Juke Box Folk Record chart and spent 19 weeks on the Best Selling Folk Records chart. 1 2 3 4 5 6 "Internet Movie Database". IMDb . Retrieved 2007-09-29. 1 2 3 "The American Society of Composers, Authors and Publishers". ASCAP. Archived from the original on 2012-05-29. Retrieved 2007-09-29. ↑ "Singer & Actress Honeymooning". Standard-Speaker. Pennsylvania, Hazleton. Associated Press. November 29, 1965. p. 15. Retrieved November 2, 2016– via Newspapers.com. ↑ "Tommy Leonetti". Find a grave. Retrieved 2007-09-29.